If you love rum you need to listen to “5 Minutes of Rum” – which is notes of rum, 5 minutes at a time. It`s a great podcast that is just starting out and episode 5 is just out. You can find it on the web – here – and then you can also find it on itunes if type in “5 minutes of rum”. 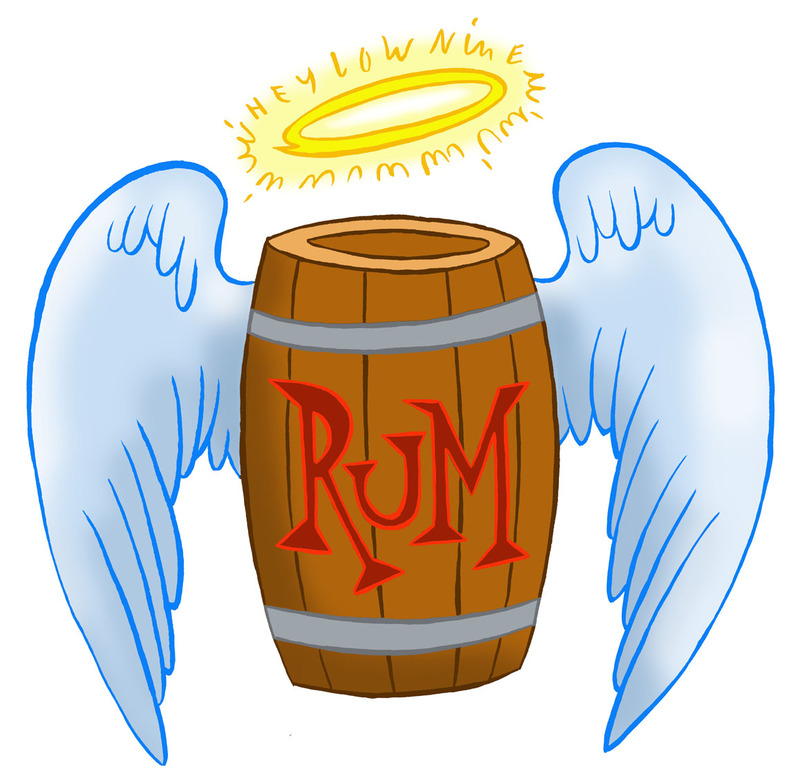 It`s made by Kevin Upthegrove aka heylownine and it´s a great podcast and who doesn´t have five minutes for rum? So go and check it out! it only takes 5 minutes per episode! and you learn a lot plus there´s recipes on the website. 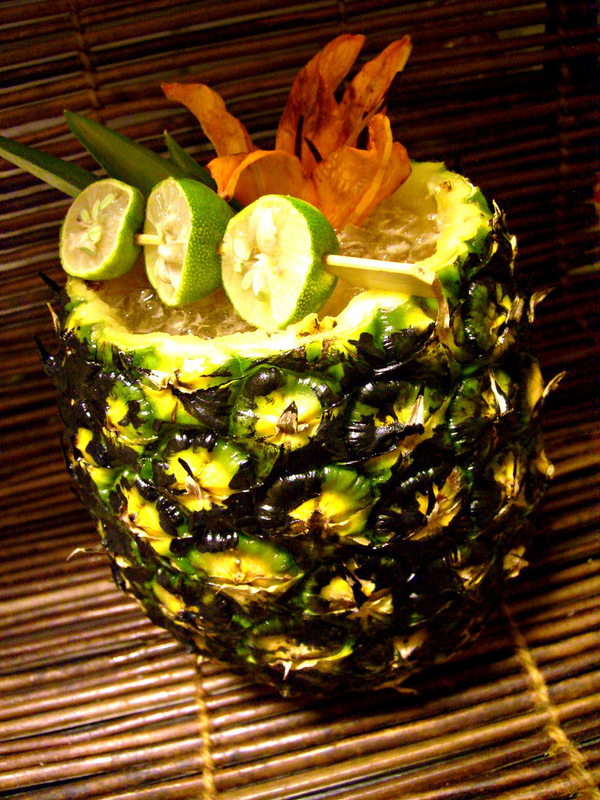 I`m a bit late to the party with this post, i blame it on the working-week…but for this booo weekend i have a rum-barrel type of tiki drink served in a for the theme black pineapple. I`m making it with – well you may have guessed it – rum – and after the UK rumfest one could believe i`d be tired of rum but no no no…that´s not the case, and i don´t think that`ll ever happen..
There`s a so much spooky drinks out there that i really didn´t know what to make…should i carve out a pumpkin or make a flaming drink? well i already did that last year, so no…Should i make a blood-red vampire type of drink? I had no clue…but then i saw that nice pineapple in the shop and decided to paint it black and use as vessel for a heavy tiki drink that should quench the thirst at least for folks who likes exotic rum drinks. Not that this pineapple looks very spooky at all…it rather looks grilled…:-) So scoop out a pineapple and paint it black. Make cinnamon syrup by adding equal parts demerara sugar and water in a pan and heat to dissolve the sugar. Add crushed cinnamon sticks and lightly boil on low heat for just a little, then take off heat and leave to cool and let the flavors blend for an hour or two. Then strain and bottle. Or use B.G Reynold´s excellent cinnamon syrup. Then melt one teaspoon butter for every 0.5 oz syrup. Add the melted butter to the syrup and stir together. 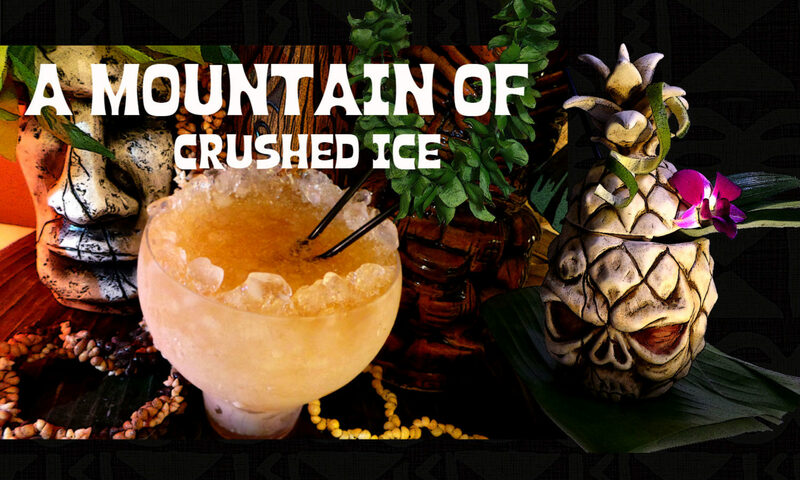 It´s simply a refreshing tiki drink, not the least spooky but there´s more than enough spooky drinks out there…in any case it´s tasty and most of all – relaxing. You can play with different rums too. This is one of my comfort mixing rums for Tiki drinks. There are a dark and a gold type of this rum and a few different agings. I have tried 3 of them, the original dark, the 12 yo and the overproof (74% /148 proof) There´s also a 12 yo “Cigar-blend”, an 18 yo and a 25 yo. 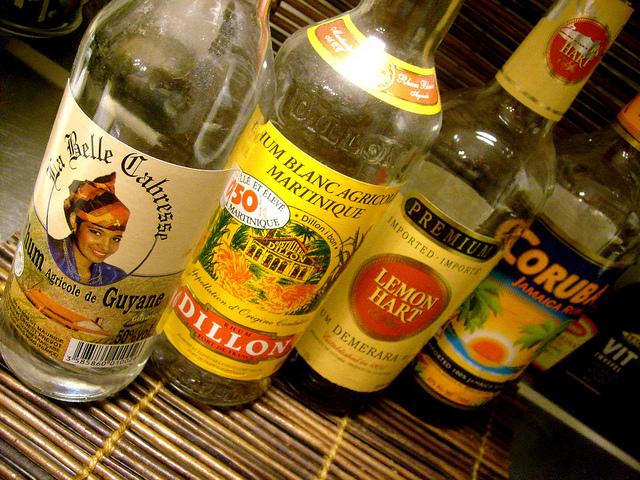 Plus the newly released four naturally flavored rums – coconut, pineapple, mango and spiced. I´m always suspicious about flavored products but some are better than others. Coruba is a heavily caramel colored Jamaican planters–style rum made with both pot and column stills rums (over 30 rums in the blend) and the rums are aged at least two years in small oak barrels. Its Bottled at 40% alcohol by volume. 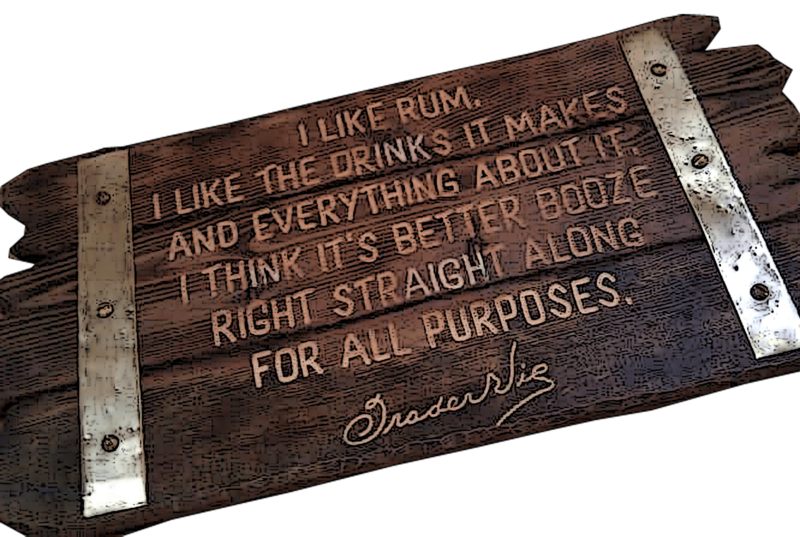 Its the kind of rum that was used in planter´s punches. In 1967 the Coruba rum from Jamaica was first imported and became the leading rum in the 70s and since then it has kept that position.The name Coruba comes from the name “Compagnie Rhumière Bale”, Basel, Switzerland – which became “The Rum Company Ltd.” in Jamaica in 1929. Later it was bought by Wray and Nephew. Coruba dark rum is medium dark amber in colour and is a heavy Jamaican style rum with a deep taste, rich with molasses. 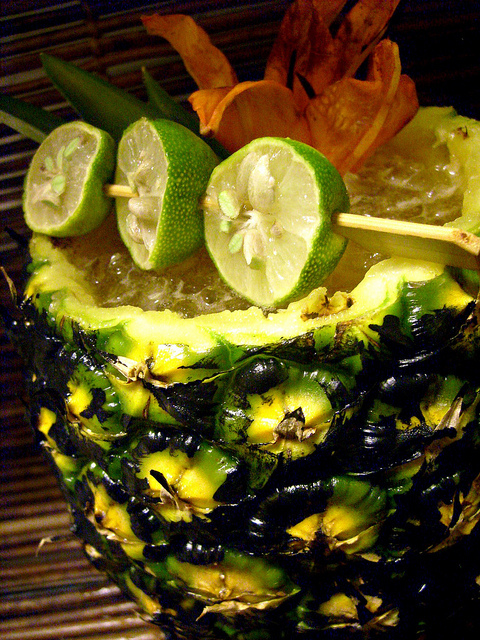 Its perfect for tiki drinks and that`s why i suppose its also very popular among tiki drinkers. On its own i find it a bit too rough on the edges (then again i haven`t tried the older ones yet, except for the 12 yo which also is easier to sip). 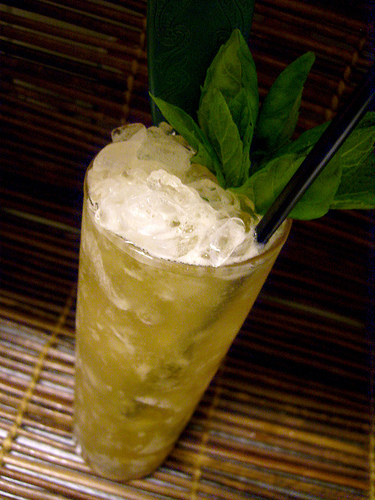 But in mixing – and especially with tiki drinks its good, it marries well with fruit juices, syrups and other rums. In my tiki and tropical drinks i prefer their dark rum. The overproof is good as float but is very strong so a little goes a long way. 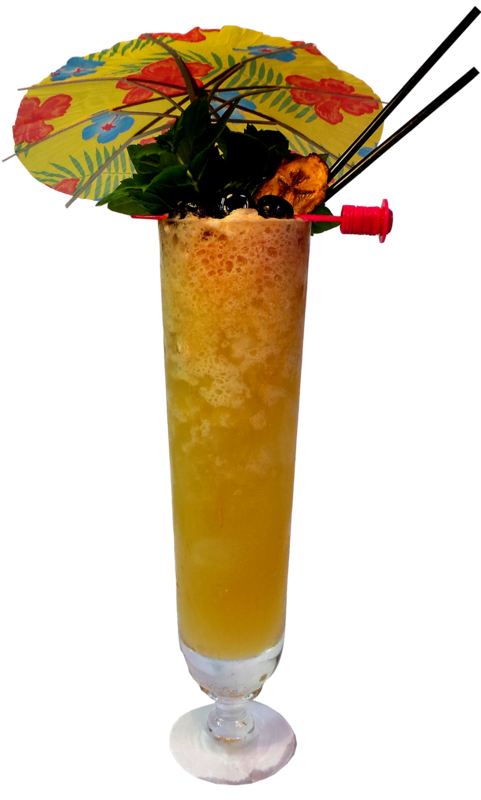 Here´s a drink from Beachbum`s Remixed where i have used Coruba dark. If you wish – add a little hibiscus grenadine for color and extra tropical tang. Honey, pimento dram and Pernod gives this drink its third dimension with spiciness also from the bitters.I also added a little splash of homemade hibiscus grenadine in this as well which isn`t a part of the recipe though. Angostura bitters are more aromatic than bitter and is the backbone of all bitters i think, and despite all great and fun bitters out there, i don´t know what we would do without Angostura. This is a tasty drink with a comfort mixing rum that is very reasonably priced.